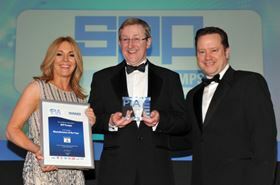 Ken Winn, operations director of SPP, accepts the award for ‘Manufacturer of the Year’. PIA host, Helen Prospero, is on the left and category sponsor Jonathan Wilkinson, CEO of AESSEAL plc, is on the right. For more than 130 years SPP Pumps has been manufacturering centrifugal pumps and associated systems. The company has a global principal in design, supply and servicing of pumps, pump packages and equipment for a wide range of applications and industry sectors. SPP pumps and systems are installed in all continents providing valuable high integrity services for diverse industries, such as oil and gas production, water and waste water treatment, power generation, construction, mines and for large industrial plants. Major applications include water treatment & supply, sewage & waste water treatment, fire protection, and mobile pumps for rental sectors. SPP supplies engineered pumping solutions focused on markets where application knowledge, service and expertise add value. The company boasts that in its markets, it has more technical expertise, experience and approvals than its competitors. SPP is organised on product/market lines with specialist engineers dealing directly with customers. All products are supported by teams of professional service engineers, a network of service centres and approved parts service. SPP provide the complete service from design through to aftersales support. The 2017 Motion Control Industry Awards were recently announced at a gala awards ceremony at the National Conference Centre in Birmingham.